Gift certificates are very popular! Certificates have been purchased for a variety of reasons including Mother's Day, Father's day, Easter, Birthdays, Anniversaries, and Christmas! "Just Because" is a popular reason as well! A personalized gift certificate is good start for you or someone you know who is looking for a fun & memorable date idea, too! (as noted on hotdateideas.com ). 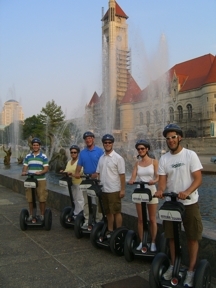 Glide St. Louis Tours offers certificates that are Made To Order. Your gift certificate can be generic, or can be personalized with a graphic that fits the occasion. TO and FROM names can be printed onto the certificate or you can personalize it further by writing them in yourself. There is no additional charge for this customization! The number of "gliders" for each certificate is up to you - and don't forget to treat yourself, as well!! The cost per person is $69.95, plus tax for either the Historic Downtown St. Louis tour, the Forest Park tour, or the Soulard/Lafayette Square Neighborhood tour. Please call for pricing when purchasing Gift certificates for special events and Charter Tours. Gift certificates can be sent to you or directly to your intended recipient. Each certificate comes with a list of Frequently Asked Questions and a full color brochure. Call us at 314-TOUR-FUN (314-868-7386) to order your gift certificates today! Any day is a good day to Segway!! !